Volume II of the Letters presents more than 700 letters, covering the period from June 1913 to October 1916, from the enthusiastic reception of Sons and Lovers to the completion of the first manuscript of Women in Love. Lawrence visits England in June 1913 and receives recognition as the author of Sons and Lovers. He returns to Italy in the autumn of 1913 to work on his new novel 'The Sisters', which subsequently becomes The Rainbow and Women in Love. Lawrence and Frieda return to England in June 1914 to be married and are caught there by the War. The letters vividly record his reaction to the War. 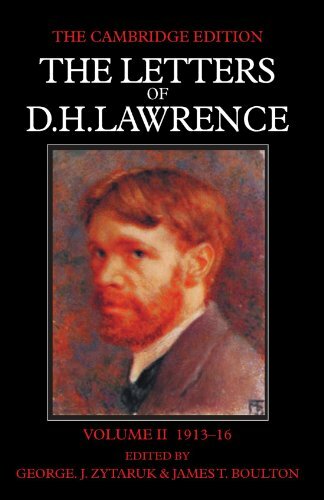 The editors' introduction considers the initial widening scope of Lawrence's literary life with his later isolation in Cornwall. Over two hundred letters are previously unpublished and others are printed for the first time in their entirety.